Christian Witness: New. Drs Angela and David Franks talk with people who work to build a culture of love and life rooted in the New Evangelization. Guest: Father Matt Williams and Danielle Olsen on the evangelization of youth and young adults. We've Got To Talk: New. Fr Dan continues CatholicTV's longest running studio series. This week's topic- "What is the Point?". One Billion Stories: New. Join Seth DeMoor as he continues sharing the stories of Catholics around the world. This week we hear stories about Religious Sisters. Spotlight: New. 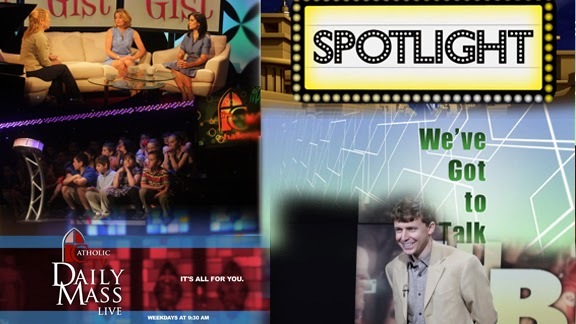 The film fathers look at James Gandolfini movies this week on Spotlight, CatholicTV's movie review show. WOW: The CatholicTV Challenge: New. Father Robert Reed tests 3rd graders' knowledge in the 9th season of WOW. This week's "Wudabout": Perfectae Caritatis. Tuesday 11/5- Lavinia Spirito of the Catholic Way Bible Study. Friday 11/8- Father Austin Litke, Blackfriar Films music video "Come My Way". The Gist: New. Rachel, Danielle, and Carolee host another great episode of The Gist. Our Guest is Matthew Weber, talking with us about college.